Ancient Corinth stood on the narrow neck of land connecting the mainland to the Peloponessus. In Paul’s day it was an important trading centre. Merchants sending goods to Italy preferred transferring cargo from Cenchrea, east of Corinth, across land to the western port of Lechaeum, rather than taking the hazardous journey round the southern tip of the Peloponessus. The Romans destroyed the city BC 146, but a hundred years later rebuilt and colonised it under Julius Caesar. The capital of the senatorial province of Achaia, the governing proconsul (Gallio in Paul’s day, Acts 18:12) resided there. Corinth was wealthy and cosmopolitan, with a mixture of Jews, Romans, Greeks; traders, sailors, skilled workers and the poor. It saw wealth and poverty and all extremes of human life. Jews came to trade; Romans were there on official business or were descendants of the original colonists; Greeks gravitated there from the countryside. Corinth was a centre for sensuality and sport, and was renowned for morals that were loose even by the low standards of paganism. To Corinthianise was a term for the lowest kind of life. At one time, its Temple of Aphrodite had a thousand priestesses who were sacred prostitutes. Paul arrived from Athens (45 miles east) in Autumn, 51 AD. Gallio’s proconsulship is thought to have begun mid-52. Paul was there a year and a half, including many days after appearing before Gallio so he probably left the city in Spring, 53 AD. He arrived without his companions, Silas and Timothy, but soon met Aquila and Priscilla. Previously living in Rome, they were forced to leave when Claudius ordered all Jews to depart in 50 AD. Whether they were converted before leaving Rome or in Corinth is uncertain. They shared with Paul a common trade - tent-making. They worked together throughout Paul’s early days. Paul preached first at the synagogue and, as was his custom, reasoned with the Jews from the Scriptures concerning the Christ they foretell. When Silas and Timothy arrived from Macedonia, he seems to have devoted himself solely to preaching. Maybe they brought funds from the Macedonians (cf Philippians 4:15, 16). As so often, the Jews’ reaction was hostile (Acts 18:6) so Paul determined to turn to the Gentiles. His centre of operations did not move far - just next door to the home of Titius Justus, a proselyte. The Lord blessed Paul’s preaching. Crispus, the synagogue leader, was converted and many others. Opposition continued despite the blessing but (Acts 18:9, 10) the Lord spoke to Paul one night, encouraging him not to be afraid but to keep preaching. This suggests that he was in need of encouragement. However, there is nothing to link this with the response he had met with in Athens nor to suggest that he altered his strategy for Corinth. An indication of this continued opposition comes with the Jews dragging Paul before Gallio, accusing Paul of persuading men to worship God contrary to the Law. The Proconsul was not about to step into a theological controversy outside his expertise and he threw out the case, telling them to settle it themselves. We read (Acts 18:17) that they all took hold of Sosthenes, the leader of the synagogue, and beat him in front of the judgement seat. It is unclear who was involved. Some suggest a crowd of Gentile onlookers did it because the Jews were causing trouble but perhaps it was some of the Jews themselves, as their leader had not put the case strongly enough. Sosthenes had obviously succeeded the converted Crispus as synagogue leader but it appears he was also converted as his name appears with Paul’s at the head of 1 Corinthians. While Paul was later across the Aegean Sea in Ephesus he corresponded with Corinth. The church was unstable and immature and had many problems. The members were mostly Gentile with a pagan background not an Old Testament one. They lacked the moral principles such exposure would have given. After Paul’s departure Apollos came to Corinth. He was an accomplished speaker and debater, something that the Greek culture of Corinth would appreciate. Peter also may have visited, though we have no details. Paul refers to him and his itinerant preaching in Chapter 9. We know from the letter that rival factions were lining up behind these notable preachers: Apollos, Peter and Paul. Others claimed to be just of Christ. 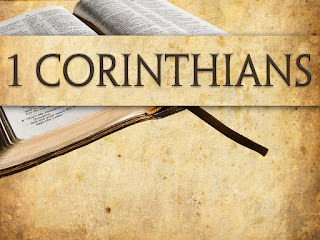 Paul wrote a letter to Corinth before 1 Corinthians. In 5:9 Paul refers to it, saying that he had told them not to associate with immoral people. They misunderstood his point and he had to make clear that he was concerned about the greatly immoral atmosphere of the city and how this would affect the believers. He was not advocating withdrawal from society but discipline within the church. We do not have this original letter, so we cannot know its contents. Some speculate that it was kept at Corinth and that parts of both our Corinthian letters contain pieces of that original letter (including 6:12-20, 2 Corinthians 6:14-7:1). There is no evidence to support this conjecture. It is clear that the lost letter produced an unsatisfactory response and there was still confusion in the church. Apollos was no longer at Corinth and was probably back in Ephesus with Paul. Cf 16:12. Paul was urging him to revisit Corinth. There is no indication that Peter was in Corinth. Paul would surely have mentioned him if he was. The church seems to have lacked strong leadership at this time. News of the church had reached Paul from members of Chloe’s household, possibly slaves in Ephesus on business. Also three members of the church, Stephanus, Fortunatus and Achaicus, had come to Paul from the city (16:17). They seem to have brought him a gift and a letter containing questions the church wanted Paul to settle. Paul’s response to the questions and the rumours he had heard, was to write 1 Corinthians. It must have been written in the latter part of his stay in Ephesus, as he has already made plans to leave for Macedonia and so may come to them soon (16:5-7). It may have been written in Winter, 55 AD, as he speaks of staying on until Pentecost, because of the blessing he is seeing. 1 Corinthians is one of the most varied of Paul’s letters in content and style. Many diverse topics needed dealing with and Paul uses all kinds of literary devices to make his points - logical reasoning, sarcasm, pleading, scolding, poetry, narrative and exposition. Some see in this the kind of verbal style he would have used to address the elders in person! Despite the wide variety of topics in the letter, a theme runs through it - how to live in the world in light of the cross. The matters dealt with are relevant to today. In the west, many issues dealt with are increasingly familiar as society grows more pagan. The letter’s structure is determined by the order the topics were mentioned to Paul by Chloe’s household and in the letter brought by the visitors from Corinth. He deals with the news he has heard first (Chapters 1-6) then says Now concerning the things about which you wrote ... (7:1). He subsequently divides the questions up by starting each new section with Now concerning .... (7:25, 8:1, 12:1, 16:1). The letter gives us an insight into the problems experienced by a young church, formed in a pagan environment. It was taken to Corinth by Timothy, or at least he would follow soon afterward (16:10). Paul commends him to the church, urging them not to despise him (a reference either to his youth or characteristic timidity). Paul had encouraged Apollos to go. He was reluctant, perhaps fearing he would harden divisions. The letter did not solve all the problems. The divisions and opposition to Paul continued, as is seen in 2 Corinthians.